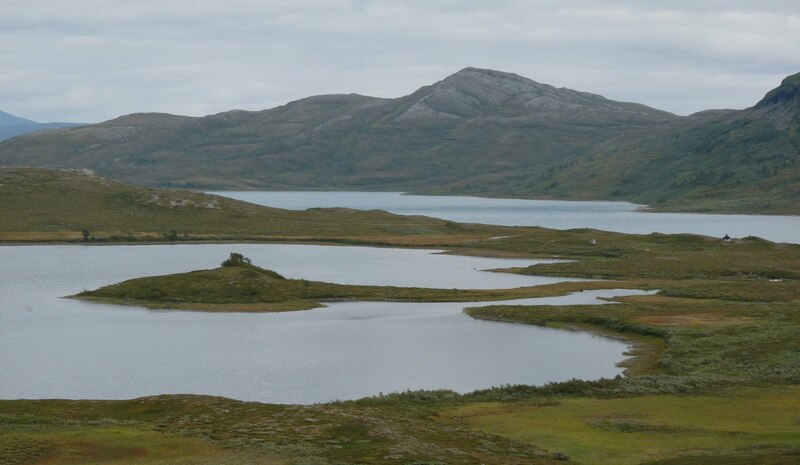 The area in Padjelanta NP squeezed between the big lakes of Virihaure, Vastenjaure and Sallohaure and the Norwegian border is largely untraveled. There are few or no trails or any conveniences for the hiker. One particular river, the Duvvgejåkhå (formerly spelled Tukijåkkå) is considered unfordable at all times and several others are unfordable at times. This curtails how you can travel in this country, should you choose to do so. What I found was a marvelous place with few traces of man, where you could pick your own route and where hills and flora are stranger and richer than anyplace I have seen in the Swedish mountains. With two trusty feet and a packraft I spent six days crossing this wonderful land. 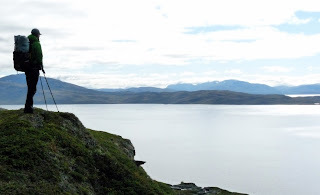 Looking back along the Nordkalotten Trail from Vaisaluokta and Lake Akkajaure. I followed this trail for the first hour, after crossing the lake on M/S Storlule. The sun was shining, but the wind was strong and cold. The wind would be a constant companion on my journey. First camp in trailless land. The cold wind remaine so I was happy to find a rock to pitch my newly made Cuben fiber shelter behind. There was also a corner behind the boulder where I could cook my evening meal of noodles. The harsh and austere land above timberline can show an unexpected softness. My route into the heart of the wilderness north and west of the great lakes Sallohaure, Vastenjaure and Virihaure lay along this valley, towards the snow studded mountains but not to them. They are in Norway, and I would swing in a great arch this side of the border and down south (left). My pack, a Gossamer Gear Mariposa Plus, weighed 16 kilos with food for 6 days and with packrafting gear at around 4 kilos. Noon of the second day brought me to the first and smallest of the three big lakes; Sallohaure. After a good loading of mashed potato, cheese and garlic I was ready to tackle the first lake crossing. My ambition was to cut corners at the lakes and ship over narrow stretches instead searching for fords at the corresponding outlets. Fording most of these rivers would probably have been possible since the water was low almost everywhere, this being late in the season. I am wearing a homemade personal flotation device made out of ripstop and bug netting and the bags in front and back filled with my water bottle of 2 litres and my 'pillow', a wine bag of 3 litres. Not something I would wear for white water rafting to be sure, but for this trip I deemed the risks of ending up in the water as close enough to nil. The second night camp also found me in more exposed surroundings than I would have preferred. Another cold evening with a biting wind blowing. I dined, if that word can be used, on my noodles, comfortably tucked into my sleeping bag inside the shelter. This became a regular morning and evening habit. Dining out was out. Next lake; the mighty Vastenjaure. Perhaps the most interesting of the three from a geological, bothanical and scenical aspect. But of course I am being highly subjective. Let us say it is the one I would most like to return to. Time to inflate the Alpacka for another crossing. This was the most strenous one; about 3 kilometers of open water in a corner of the big lake Vastenjaure. Not only were my hands numb (I couldn't manage the cord locks on my rain jacket right after my crossing) but it is a bit mind-numbing as well to paddle distances like this, since you have no feeling of getting anywhere. You paddle and paddle and never seem to get any closer to the other shore. Although of course, each paddle stroke brings you 1 meter or so closer to your goal. But then, I am no experienced kayaker. Looking back across Vastenjaure I could see the white limestone cliffs of Aralåbddå. I had hoped to paddle along at least part of this 10 kilometer long rock face, and maybe explore a cave that is supposedly only accessible from the water. Alas, some other time. I was a bit behind schedule and had set my sights on spending the night by another spectacular sigth; the Jaurekaska falls. I did not have the extra half day that I would have needed. At Jaurekaska the lake of Virhaure is pouring its water into Vastenjaure, the water level dropping about 30 meters over a distance of 2-3 kilometers. Some impressive rapids are the result. Probably even more impressive earlier in the summer with snow melt and high water levels. 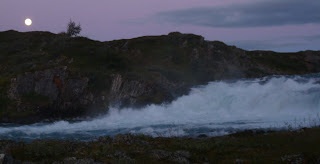 The following morning I followed the northern shore of Virihaure, here looking west towards the Norwegian border. Sunny but with the same incessant, biting wind. I stopped for lunch in the lee of a rock face in a nice little cove before using a couple of small islands in the western end of Virihaure for leapfrogging the bay of Alasluokta with my packraft. My hands got cold this time as well, maybe a pair of neopren gloves is not a bad idea. Although in my experience bare hands usually work just as well, at least in more benign temperatures. Through a sometimes strange landscape that brings to mind the west coast of Scotland (it is just trees, not a castle..) I hiked towards glacier-fed Lake Gasakhjavrre and the river that blocks entry into wilderness area I had been hiking, from the south. 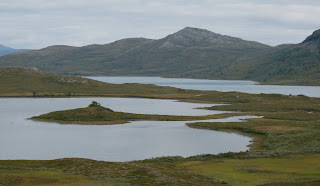 Gasakhjavrre is continously fed with grey, silted water from the giant Norwegian glacier Blåmansisen (The Blue Man Ice) and the river running from the ice via the lake and then on into Lake Virihaure is known to be unfordable at all times. YOu can walk all the way up to the glacer and cross on that, if you know what you are doing. Below the lake the river is called Duovggejåhkå (older spelling Tukijåkkå). It has a long stretch of rapids intermingled with wider bodies of water before joining Virihaure. Here can be seen the first of many rapids in Duvvgejåhkå as it leaves Gasakjavrre and flows on down to the right to Virihaure some 6-7 kilometers away. Of course, with a packraft if was a five minute jaunt to cross the end Gasakjavrre, just before the rapids seen in the middle of the photo. At lake Sårjåsjavrre civilization beckons from the other side of the unfordable outlet of the lake. The hut known as "Consul Person's cabin" is sitting there. Officially the "Sårjåsjaure hut" it is according to many the most beautifully situated of all huts belonging to the Swedish Tourist Association. The Nordkalottleden trail passes on its way to (or from) Sulitelma. Coming to the cabin from the direction I did is uncommon, since you have to walk around the whole lake to reach it. With a packraft it was of course only another five minute paddle across the lake end, before the rapids. On the shore by the cabin I had coffee and chatted with some people, some of whom stayed in the cabin and guy with a tent on a three week trip through some really great country. 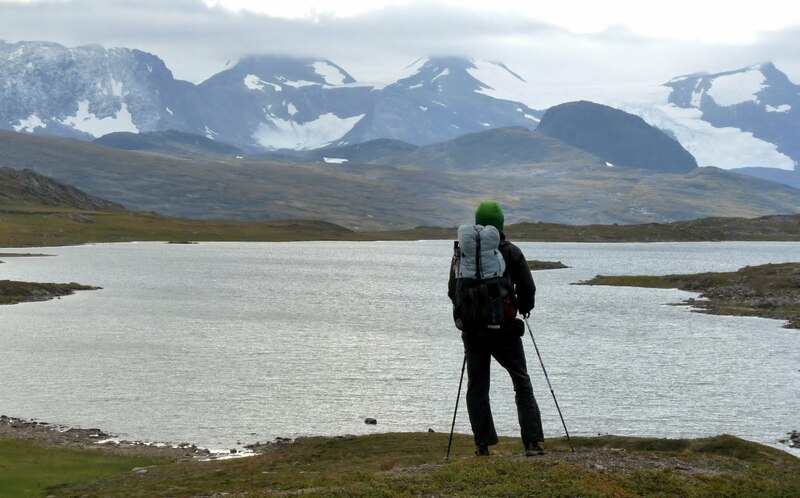 He had started a week ago from south of the cabin through county where few walked and was continuing towars Sarek NP. Sounded like a magnificent walk. I hopped onto Nordkalottleden and made really good time with a light pack and a trail to follow. I followed the left shore of the lake above, underr the shadow of mount Sårjåstjåkkå with its hanging glacier. The border to Norway is crossed about halfway along the lake. There is a worn metal sign, but no armed guards. Probably one of the most peaceful borders between EU and "abroad" (Norway is not a member). Across the border the trail got steeper and pointed upwards to higher and steeper peaks. We were in fact in Norway. I spent the last night out by a cold and windy lake. Finding the trail in these rocky surroundings would not be easy if it was not for the orange 'Ts' painted by the Norwegian Tourist Association on strategical rocks. If you follow the 'Ts' long enough, you will find a green valley. Like here at the town of Sulitelma where the self propelled part of my journey ended. The gear used and the shelter that I made for this trip will be treated in separate articles coming up. What a wonderful nature. I like! 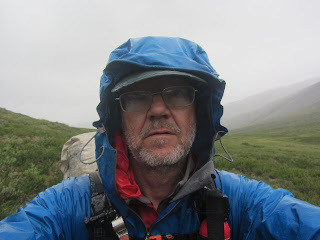 I am just back from Greenland - I can very well relate to the search for lee and taking the packraft for a 5-10 min paddle instead of walking over boulders! Greenland, sounds like you really would have a story to tell. Did you use a packraft? I have been looking at parts of Greenland with that in mind. Wow. Absolutely amazing looking scenery for what must have been a very fulfilling trip. The photo from the plateau between Vastenjaure and Virihaure is my favourite. Beautiful to see the evening light playing over the landscape like that. While I have one eye on the onset of Autumn and Winter I also have one eye on next summer and I know I will be undertaking a packrafting trip to similar scenery. Truly inspiring stuff! Jörgen a fantastic report, I expect I will be in some of that area next summer, no packraft though. I will be interested to hear about the dimensions of your shelter as it looks similar to the Go Lite Shangri La 1 in size. Thanks Roger, yeah it was a great trip in great country. You can access parts of the area from the north and west (Norway)without a packraft. Some heavy fording, depending on water levels, will have to be expected. I'll be happy to give you some input. My tent is smaller than the Shangri-la 1, but that was the general shape and size I was working for. I have an old tent that I used as pattern as well as newer silnylon version that I made in 2004. Best compromise in weight and weather-worthiness (is there such a word?) I have found so far. I'll be back shortly with an article. Truly spectacular scenery you travelled through. I can see why others want a packraft. Paddling among the lakes with such scenic views to admire certainly appeals. Yes, one of the neat things about having a packraft is that you can plan your route very differently from walking, especially in an area like this. And even in country you know very well you get a different point of view. Looks like you had a great time. I like the idea of packrafting to get to the more remote places. 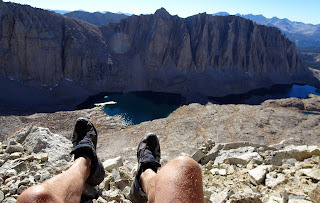 Your photos and report make me yearn to get out alone again in those great landscapes. Looking forward to reading more about the shelter.